I’m the person at the office who is always advocating recycling plastic bags. I set up a deposit location in the office and personally take responsibility for bringing the bags to the grocery store for recycling. It’s one of my pet peeves because it’s so very wasteful to use plastic bags for shopping. Of course, I don’t. 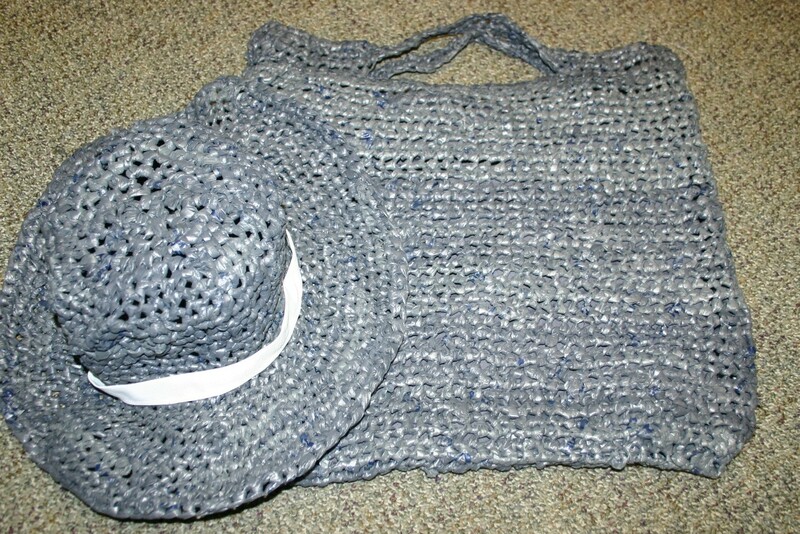 One day I was doing some research on the recycling process and came across website after website that showed what people were making from plastic bags by crocheting and weaving. I was so happy to see that people were using their own, basic ingenuity (and artistic talents) to turn plastic bags into things that are reusable and long lasting. The bug bit me and I started making my own crafts. The first thing I made was this really nice bag from Walmart bags. They were easy to come by because I went into Walmart and asked for their recycled plastic bags. I walked out of their with dozens of bags! After I made my first bag, I went and showed it to the ladies at Walmart at the customer service desk and they were so impressed, they gave me more bags. Now, all I have to do is show up and they start digging out the bags. One woman even offered to set them aside for me everyday. This was the first time I ever made a hat of any kind. I started it, watched it form and tried to make sure I was putting in enough stitches and reducing the right amount of stitches to make it shape properly. I had to pull the stitches out and restart at least three times before I got it right – but, I got it right and the hat is really chic looking. I added a white ribbon and it’s good to go now. Together, they look very classy, and the finished products are very, very sturdy. You would NEVER know these used to be plastic Walmart bags! This would be a nice business for someone who wanted to make these and sell them on the internet or at craft fairs. There are a variety of colors available with plastic bags, so the color combinations can be quite diverse. Okay ladies – get out your crochet hooks and start gathering plastic bags, making your “plarn” and get busy. Make sure you teach your children, your friends and others how to do this. Then share your creations with us. We would love to inspire others. Plastic is causing a growing dilemma on our planet. If you do a google search, you can see the kind of harm it is causing in our oceans and on our lands. There is an actual “plastic island” floating around the world: http://en.wikipedia.org/wiki/Great_Pacific_garbage_patch. Animals don’t know the difference between plastic and the food they think they are eating. They are dying by the hundreds. Fish that ingest plastic end up on our dinner tables when they are captured by fishing companies. Please do some research and share it with your children, your neighbors, your facebook friends and anyone else you can think of. Then discuss AND implement things that we can do differently to prevent further harm and to reduce the damage that has been done. For starters, DO NOT use plastic bags any more. They should be banned at this point given what we know about the harm they cause. Reusable bags make sense on every level. Human beings are very creative creatures. We can come up with ways to reduce, reuse and recycle. What are some of your suggestions?